It has been said many a time that the English language is one of the most difficult to master. There are exceptions to every grammar and spelling rule, and even exceptions to the exceptions. Children find learning even the fundamentals is confusing and frustrating, and that’s before they even move on to spelling and punctuation. Luckily the creative folks at Grammaropolis LLC started creating educational music videos (no, really!) to help reinforce language skills, and recently took their ideas and spun them into the titular app. 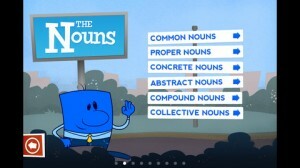 Adding quizzes and animated shorts to already popular music, the Grammaropolis app is – as their iTunes description reads – “hailed as a Schoolhouse Rock for the 21st Century”. Within the app are several sections containing activities for eight different parts of speech but only the Noun section is available without any additional in-app purchases. Colorful characters, bouncy music, and clever quizzes take the players through the ins and outs of nouns and real-life words and situations help kids relate to the teaching at hand. Intermittent videos break up the monotony of serious learning, and this music is what put Grammaropolis on the educational map in the first place. Unfortunately the fun ends with Nouns unless you want to fork over $1.99 for each additional section or $12.99 for the complete game. Needless to say after the fun I had with the free content I wanted to check out Pronouns, Adjectives, and the six other components, but I’m frugal (cheap?) and refuse to pay more for an app that was initially advertised as free. However if the rest of the game is executed in the same fashion as what I played then I would happily pay for the full download if I had a school-aged child who would enjoy it as much as I did. 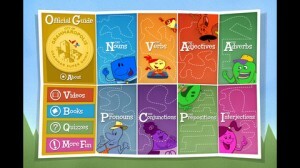 Beginner readers and the elementary crowd will find this app fun and educational.